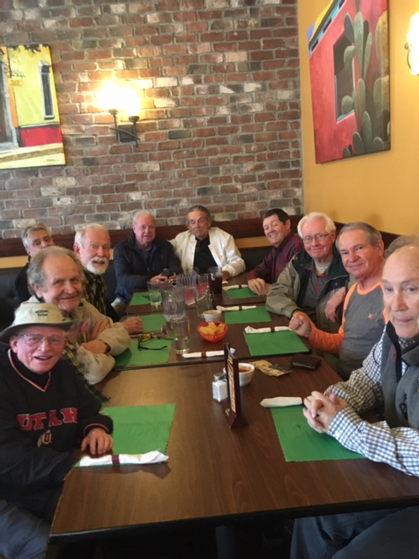 March 27, 2019 - The OHS Guys joined up at Ligori's Pizza & Pasta, 4780 Old Post Rd Ogden. The brotherhood was updated on classmates and recounted stories of long ago. Start Left: Dennis Gladwell, Ed Van Zweden, Mike Daz, Rick Schow, Mike Stoddard, Jim Furlong, Richard Orton, Lee Stone, Tim Holm, Wynn Phillips. 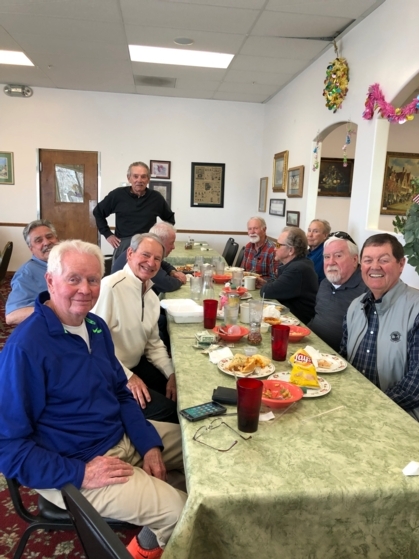 February 27, 2019 - The OHS Guys joined up at Maria's in Ogden for a bite to eat and to bring all up-to-date on busy lives and medical conditions. If you want to join the group, the next lunch is on March 27 at Ligori's Pizza & Pasta, 4780 Old Post Rd. Ogden UT 84403 at noon. Left around the table: Bill Tribe, Chuck Stanley, Jim Furlong, Mike Daz, Rick Schow, Mike Stoddard, Wynn Phillips, Dennis Gladwell, Ed Van Zweden, and Richard Orton. December 2018 - The OHS Guys gathered again at the University Broiler & Grill on Harrison. The eleven-strong class members enjoyed great food but even better stories. Some stories remembered some recalled, some with snippets conjured up. It was another successful gathering with friendships renewed. The OHS Guys are gathering together at different eating establishments for lunch and good companionship. Here is a picture of the latest attendees at the Oaks in Ogden Canyon. All classmates are invited to join with us. Just contact Ed Van Zweden at edvanzweden2@msn.com if you want to have lunch and tell war stories. Unfortunately, we met this month without a charter member of the group, Alan Leishman. Alan passed away a few weeks ago. Alan is in the March 26, 2017 picture in the yellow shirt. Left to right: Mike Daz, Bill Hart, Jim Furlong, Jack Wahlen, Chuck Stanley, Eddie VanZweden, Dennis Gladwell, Alan Leishman, Nick Breeze, Mike Stoddard. We had an excellent evening visiting with OHS '61 classmates and spuses/guests. We met at 5:00pm and just visited for about an hour or so and then had a buffet-style dinner. There was no program but Madeline was presented a beautiful live orchid Hawaiin lei for her pro-active work to get us together. Thanks to the committee who did lots of the leg-work and staffing. They were: Madeline Pappas Coleman; Sandy Sachter Sowerby; Judy Cartwright Banks; Lynda Cawley Goucher; Bonnie Russell Whalen; and Wynn Phillips. We had 33 attendees. If those who attended have picutres they would like to forward for the website, please email them to utahwynn@yahoo.com and he will up-load them. Bill Wade, while recuperating from shoulder surgery, had too much time on his hands. He used that time to determine the death rate and projected deaths of our classmates (numbers, not names). He shared the info at the gathering. Here are his charts. He started with Victor Acuna, our first classmate to die and used Garth Westover's excellent gathered information on deceased classmates to calculate the below charts. Bill noted that from the data, "the realization came that we are on the down slope of life and if there is anything we have always wanted to do, now is better than late. 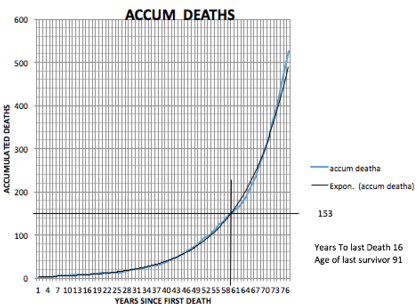 You will notice that the data beyond the current 153 deaths is "fictions" in that I forced a fit. I don't think it invalidates the conclusion. We all gonna die and not too long from now." We appreciate Bill's mathamatical skills. When I first moved back to Utah in 2004, one of the first things I thought about was Ogden High School. I loved the school but not necessarily my high school years. Let me explain. When I was in the 7th grade, I developed chronic back pain and was told by Doctor Gudmunson that I had spina bifida and I could play baseball but never play football or wrestle. I had been playing baseball all my life and when I reached OHS and tried out for the baseball team as a sophomore I realized that I would be sitting on the bench much of the time because Dave Gray was an awesome pitcher with a fastball that literally scared the batters half to death. All I had was a curve ball (I guess they really call it a slider these days) that I could throw at the batters head and it would drop about a foot and curve about the same amount so it came in belt high and over the plate. That was fine until the batters learned to hit the curve and I was suddenly a second rate pitcher. At tryouts, I took batting practice against Dave, took my obligatory 4 swings, dropped the bat and headed for first to “run it out”. As I rounded first base my foot caught a coke can laying in the base path and rolled my ankle and hit the ground. By the time my ankle had healed, the season was 6 weeks old, the team had been selected and my “professional” hopes had been dashed. I tell you all this because it is a prelude into my feelings about OHS. I suddenly found myself with no friends. All my friends were involved in sports and I was out. Jim Whited and Orrin Sharp and I became the three musketeers. While Jim did make the football team, he was not in basketball or baseball. Orrin was not in any sports. The three of were almost inseparable. Jim and I even dated sisters, Jean and Joan Waggoner. To compensate for no after school activities, I began working at my dad’s gas station every day after school. That further separated me from classmates. Joan and were as they say “an item”. Joan went to Weber and was a year ahead of me. I actually lied about my age to her to get the first date. At Central, I had felt like the big fish in a small pond. I was on the varsity baseball team as an 8th grader and was the starting pitcher in the 9th grade. I dated a cheerleader and became president of the 9th grade. Now, in high school, I felt like I had fallen a long way and felt like the small fish. I tried to compensate by developing a really close friendship with several girls but never dated any of them. Penny Madsen (Young) , Judy Cartwright (Banks), Sandy Sachter (Sowerby)…we all shared our love issues and personal secrets and developed a bond I feel even today. So, back to the reunion. As I began to say, when I moved back to Ogden, my first thoughts were of OHS. I decided to try to remove the old stigma of not being in the “group” and try to renew some old relationships that had I had missed out on. My first inclination was to have a 45th reunion so I contacted Wynn to see if we could generate enough interest to have it. I sent out 50 or so emails asking if anyone was up for a 45th reunion and received one reply and that was from Dennis Gladwell in South Africa. He said he was interested but couldn’t do much from the jungle. So by the time it came around for the 50th reunion I was a bit skeptical as to how much support we could get. I contacted Wynn and he indicated that several other people had contacted him and all we needed to do was have a kickoff meeting. I volunteered my house and the ball started rolling in January 2011. I was amazed at the support we received. People were begging to be on the committee which wasn’t necessary because we were an ad-hoc committee anyway and anybody who showed up to the meeting was on it. It wasn’t that they just wanted to be on the committee, they actually jumped in and did things they weren’t expected to do. They created an event that none of us on our own could even visualize. Gene Newman was absent for that first meeting. When Wynn said we needed to find a leader we looked around and since he wasn’t there we elected him unanimously. Then we got down to business. Linda Fowler Henderson had been the treasurer for the 40th reunion so she volunteered to do itagain. Wynn informed us that were was a little over $900 left in the bank account from the last reunion so at least we had some seed money. I was insistent that we have a cash bar so that created some issues with liability. Frank Noel, retired judge, offered to look into that issue. We subsequently were forced to form an LLC to protect the committee members from liability issues and Frank handled all those efforts. Sandy Ross Shupe volunteered to find work on the catering for the various events, John Nelson and Linda signed up to do the program for the dinner, I volunteered to do the “finding effort” locating as many of the classmates as was possible. Mike Anderson volunteered to help me out with that. I had done some thinking about what I thought should be in the events and submitted a list to the committee of my suggestions. I had thought that since it was such a big deal to have the 50th we should schedule 3 days instead of 2. I wanted the picnic, the sock hop and the dinner. It was decided that 3 days might be a hardship on some of the travelers. Jim Farrell wanted a golf tournament. Kent Coleman, who wasn’t at the meeting, later came up with the offer for the brunch and bowling but he wanted it on Friday. With the golf match, the picnic and the sock hop all on Friday, that just wasn’t going to work so we placed in on Saturday am. My request for a cash bar sort of dictated that some of the venues were out and I don’t now remember who came up with the Browning Theater but in retrospect it was a brilliant choice. The only drawbacks were that we had to come up with $1500 plus $150 for the cash bar in advance. We ran through the $900 seed money pretty quick. One of our members donated $1000 to the kitty which was incredibly generous. Jim Farrell, Mike Stoddard and Alan Leishman all banded together to put on the golf tournament. I downloaded the data base provided by Garth Westover and sorted it into those who had email address, no email but phone numbers, no phone numbers but had addresses. I found 6 other people who volunteered to do calling, I divided the 360 resulting people with phone numbers but no email and divided it up between the 7 of us. I then sent letters out to the people who didn’t have either email or phone numbers (about 65). At the end I believe there were only about 60 people we were not able to locate. Not too bad out of a registration of 640. We ended up having 5 or 6 committee meetings between January and August to report on progress and get ideas on how to solve issues. I can honestly say I have never worked with a more diverse and talented and dedicated people in my life. People came up with strengths and abilities that were truly inspiring. There are plans afoot to continue meeting periodically to maintain at least a cadre of members to keep things going for the foreseeable future and I will do my best to keep up as many contacts as I can. One last note. Wynn Phillips and Garth Westover are the mainstays of the organization. Without their tireless efforts in maintaining the website and the data base over the past 20 to 30 years, my job would have been impossible and I honestly believe the whole event would have been impossible. These two guys had better stay healthy. Thank you to both of you. There are pages more that could be written to describe the efforts of the people but I’m afraid I would use more space than is allowed and I know I could in the end still not identify all that went on. It was an incredible journey. Thank you for making my high school years become an enjoy able time. Morning (9am) - Mt Ogden Golf Course - Golf Tournament managed by Jim Farrell and Alan Leishman; We will have a 9-hole (cost $20) and 18-hole (cost $40) option; Golf Committee is determing prizes for the event. Noon - Picnic at Mt Ogden Park; Bonnie and Jack Wahlen are Committee Chairs; No cost; They will have a banner up to show the way. Bring your own food for this event. Evening (6:00pm) - Sock Hop in the commons area of OHS; Tours of the audtiorium and building will be conducted through the evening; Bill Tribe will provide background and musical entertainment. Live Music.. Most popular tunes from 1961 and late 50's.. Attendees can participate on the dance floor , or in their chairs whether wheeled or stationary.. Mystery Line Dance... Sing Alongs and or Solo if you dare. Awards for the best speciality dancer as determined by the DJ Crazy Willey... Or Wolf Man Jack who ever that was. Cost is $12/person; Sandy (Ross) Shupe is Committee Chair with Claudia (Russell) Hammond and Judy (McFarland) Radford in charge of decorations. Sock Hop Menu: Peach tarts and brownies (orange and black deserts); vegetable platter; water chestnuts; sweet and sour balls; crossiants with ham and cheese, roast beef, or turkey; pasta sallad; and Japanese water punch. Morning (10am to 1pm) - Breakfast and Bowling at Sparetime Famlly Fun Center, Roy Brunch is $10 - includes salad, sandwichs, cookies, and drink. It also includes bowling and other available games. Madeline Pappas is Committee Chair and has others on her committee including Coleman; See map below. Evening (6:00pm) - Dinner at Browning Theater at Union Station (catered by Union Grill); Cost is $35/person; Theme is "Nifty Fifty". We will have a memorial for those classmates who have passed on. Aloma (Byington) Blaylock will bring her excellent collection of memorabilia. John Nelson is Committee Chair working with Lynda Henderson and others. Dinner Menu: A buffet –Beef tenderloin in a cabernet demi glaze; parmesan chicken; Stlantic salmon w/dill crème friache; roasted red rosemary potatoes; spring salad w. dried cranberries; feta and pecans; homemade foccacia bread and butter; assortment of mini desserts; iced water. Please notice there is the option for anyone to donate extra toward the reunion expenses. As a class we would like to make a gift to the high school, and monies donated beyond the expenses of the reunion will become a part of that gift to the high school as decided upon. Thank you for your consideration. Finders Committee: Bill Wade reported that we are getting two to three new classmates per day signing on to the website, with a total of 72 at this point who say they plan to attend the reunion. Wynn and Bill have sent out a general appeal by email to all classmates whose emails we have to contact others in the class to sign on to the new website and update their profiles. Bill stated that his committee is continuing to call classmates alerting them to the website. It was decided to send out info every two to three weeks to build excitement. GOLF: Jim Farrell reported on the golf scramble that will be held Friday, Aug. 19th in the am. The location that has been decided upon is Mount Ogden. Jim felt that a scramble would work for all levels of golfing skills. Price is yet to be determined, but separate from other fees. SOCK HOP: John Nelson had spoken with Bill Tribe and felt that the idea of recorded music of the 50's & 60's might be a better avenue than trying to have a band. Bill has offered his sound equipment and possibly might act as a D.J. Decorations were suggested as a reflecting ball with a false ceiling of orange and black crepe paper. Claudia Hammond offered to head up the decorating, along with Bill Wade and Linda Henderson and others as conscribed. Cut outs of the class mates in full size could also be used. A 50's car parked out in front with cut outs of the cheerleaders was suggested. Refreshments of orange eclairs and cookies catered by Sandy's. Dress was suggested as 50’s motif. Saturday A.M. Breakfast: Location is still unsure. We would like to have it in the lunch room at the school but so far there is no confirmation on that. We are assured that there will be a room set aside for us to use. A time of 10 a.m. till noon was agreed upon. Breakfast would be light such as Continental. It was suggested that at that time honors could be given for past graduates from the first graduating class. It was thought also, that this might be a good time to have a guest speaker. It was suggested that this event have no specific charge to ensure a good turnout. A tour of the school would also take place at that time. Saturday Night: Time 7 -10 pm. In the Browning Theater. A deposit of $250 has been made by Linda Henderson on March 10, 2011 to secure the room. A contract must be sent back to the Union Station with signatures and a requested deposit of $150 for the reservation of the bar. Frank Noel agreed to look over the contract for any suggested changes. Number of attendee's is looking good at this point and everyone was optimistic about having a good turn out. The food will be done by the Union Grill using their caterer. We talked about decorating with centerpieces. Sandy Shupe was going to check with the Union Station to see if they had any we might use. It was agreed that the program should be kept light with a few of the class members performing. Sandy volunteered that her family including son Ryan of “Ryan Shupe and the Rubberband” would be happy to perform if his schedule is open at that time. Gene suggested that other classmates be found who also have talent and would like to perform. 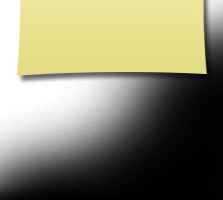 John Nelson suggested that a woman be the M.C. Claudia Hammond and Linda Henderson were asked if they would like to do it and Linda accepted. It was suggested that we consider doing a DVD to give to each class member attendee paid out of the budget. Wynn had obtained an estimate from a videographer in Ogden who quoted $30 per DVD on an order of 125 minimum. It was decided to get quotes from other videographers and discuss further at future meetings. Gene assigned Frank Noel to look into it closer and make recommendations. The idea to not charge for the breakfast to assure a good turnout was considered. We also discussed opening up the opportunity broadly to other class members to donate, which would give us the ability to keep the cost down to classmates who might not come at a higher reunion cost. This would also make something like a DVD more feasible to provide to everyone who comes. Next Meeting: The next meeting will be at Linda Henderson's, 2534 West 1800 North, Farr West, Utah 84404, 802-668-7090, on ( to be decided, one month from now, preferred date for Linda would be April 20th) from 6p.m. - 9 pm. Dinner will be served. RSVP, as soon as possible would be appreciated. A Little Class of '61 Trivia! Robert Marsh is married to our classmate Sharon Anderson. Kent Argyle was married our classmate Beckey Rounds (deceased). Joseph L. Wright was married to our classmate Karen Arnold (divorced). Bruce Bennett is married to our classmate Linda Marocchi (divoriced). Gary Breitweiser is married to our classmate Rita Thomas. Gary Waldron is married to our classmate Pamela Sue Pullum. Jack Wahlen is married to our classmate Bonnie Russell. Mike Shaw was married to ouR classmate Judy Lambert (divorced). Chuck Stanley is married to our classmate Judee Robb. Donald Brent Wood is married to our classmate Diane Starley. Stephen Summerill is married to our classmate Judie Faulkner. Current status of the couples above is unknown. Program Committee Chair: John Nelson, with Jim Farrell and Bill Tribe as members. “Finders Committee Co-Chairs: Bill Wade and Mike Anderson. Bill Wade and Mike Anderson have divided up the class among 7 of our classmates. They are now aggressively finding classmates. 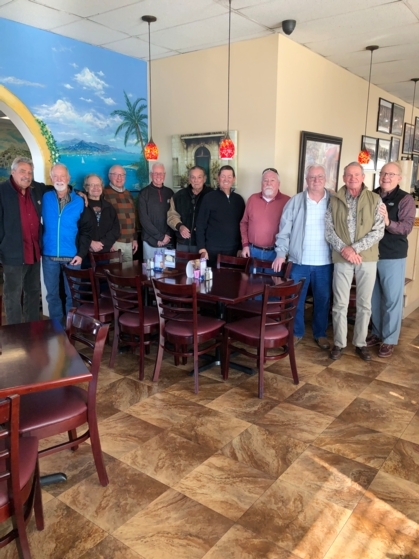 The fifty year reunion planning committee met at the home of Gene Newman in Sandy, Utah, Wednesday evening February 16th at 5:30 p.m.. In attendance were: Gene Newman, Wynn Phillips, Sandy Ross Shupe, Mike Anderson, John Nelson, Linda Henderson Fowler, and Brent Stock. Bill Wade was unable to be there, so Mike Anderson reported on behalf of the "Finding Committee". Appreciation was expressed to Wynn Phillips, Bill Wade and Garth Westover for their great contributions in bringing the web site to its present status. Sandy Shupe reported on suggested activities to include on the first day an activity such as golf in the afternoon, followed by a sock hop and refreshments in the evening to be held in the gym. She suggested a morning continental breakfast in the cafeteria with a group foto on the steps and a tour of the building. Saturday evening suggestions included dinner at the Timbermine or some other place perhaps the Union Station with dinner catered. Sandy was asked to check out the possibility and desirability of the Union Station. The objective was to find a place where we could have a program with participation from class members. John Nelson and his program committee have come up with some good ideas on what to do at the events and Sandy Shupe was invited to attend the meeting of the program committee to be held in late February or early March. 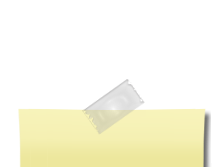 Wynn Phillips reported on the web page and gave instructions on its usage. The immediate need to find more class members was discussed and Mike Anderson reported on how that approach could work. Wynn and Mike advised that they will move ahead with haste to get the web site totally operational. It was thought that the fastest way to get more updates would be to contact those who are currently found to contact those they know on the inactive list and inform them of the web site and encourage them to update their profiles. Then a calling effort would be organized to contact all possible from the past lists where phone numbers might still be good. A need was expressed to find more class members who would be willing to help on the planning and preparations for the reunion. More volunteers need to be found. The theme was discussed and the idea of "Looking Forward" was proposed by the Program committee. Prior discussion had considered the theme "Back to the Future". No decision was made. The budget and cost of attendance was discussed and it was concluded that the cost of the reunion should be held at or under $61 per attendee. (Class of '61; get it? Thanks John Nelson, cute idea) It was decided that the various activities would be charged for individually since some may not be able to attend all events. Linda Henderson and Gene Newman will oversee the budget and cost control efforts. It was concluded that the committee would meet again sometime around the middle of March and Linda Fowler promised mean baby back ribs if we would come to her house. Gene Newman is to determine and communicate a date to everyone. The meeting was adjourned around 8:30 p.m.
FOR YOUR INFORMATION - The Ogden School Foundation fournd at http://www.restoreogdenhigh.org/ is accepting donations for the Phase 2 portion of the restoration. 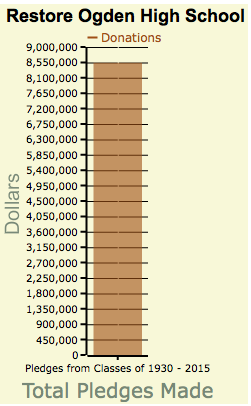 Here is their gauge as of today, a total of $8,539,642.68. The Class of '61 has donated $118,398.68 to date. We are the Third Highest Class for donations. Please donate if you haven't done so. 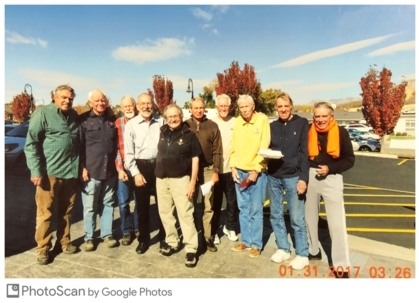 Feb 16, 2011 - The 2nd Reunion Committee meeting was held at Gene Newman's home in Sandy, UT. Those who attended left to find 3 inches of snow and blizzard conditions to drive home in, but hey, all for the Class of '61! Jan 8, 2011 - The Class Reunion Committee was organized. See comments above. Jan 1, 2011 - Just for a "gee whiz" number, we have 642 classmates names in our database, 92 of whom are deceased. That is 14.3% of our class. Dec 10 2010 - Bill Wade starts connecting year book pictures to classmates profiles. Lots of work for Bill but lots of fun for the classmates. Nov 26 2010 - New OHS Class of '61 Web Site goes live! Nov 26 2010 - The Standard Examiner had an article that the OHS Restoration is moving ahead on Phase 3. Phase 2 is supposed be done sometime in the Fall 2011. That is when we might consider holding the 50th Class Reunion. Aug 2010 - We contacted Janis Vause, Executive Director of the Ogden School Foundation. She indicated that the restoration should be completed sometime in August or September 2011. We were interested in those dates to see if our class could hold our reunion at the same time so that our classmates could assist or, at a minimum, attend the official events. They welcome any assistance we can provide. Although we still do not know the official dates, we can at least get our class reunion committee together and start planning. If you would like to help with the 50th Class Reunion, please send a reply to this email and I will add you to the list of volunteers.